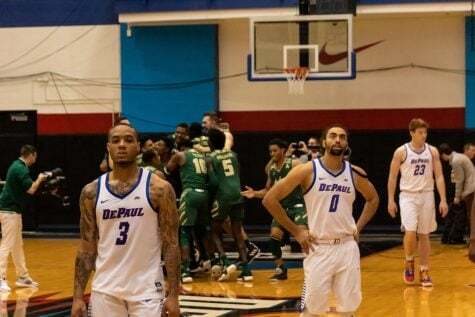 Enjoying little success over the last two decades, both DePaul and Loyola were racing to bring the Windy City back into the college basketball scene. This March, Loyola won that race. Loyola-Chicago’s men’s basketball program ended their spectacular NCAA tournament run Saturday night with a 69-57 loss to No. 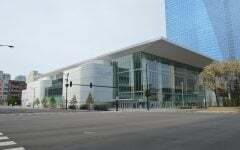 3 Michigan in the Final Four, and the DePaul Blue Demons watched from home for the fourteenth consecutive year. 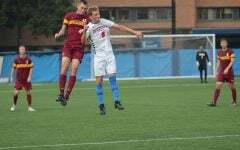 That drought was even longer for the Loyola Ramblers, who won the Missouri Valley Conference championship game on March 4 to earn the program’s first NCAA tournament berth since 1985. After DePaul’s men’s team ended the 2004 season in the second round of the NCAA tournament and then sunk to the bottom of the Big East in 2005, the association between the Windy City and college basketball began to fade. 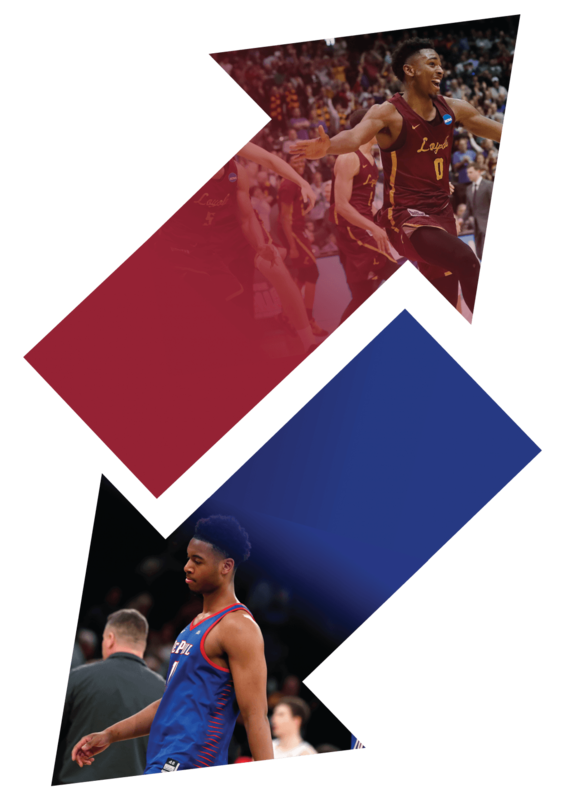 Over the last decade, the Blue Demons and the Ramblers have been racing to forge a path back to the NCAA tournament and into the national spotlight. 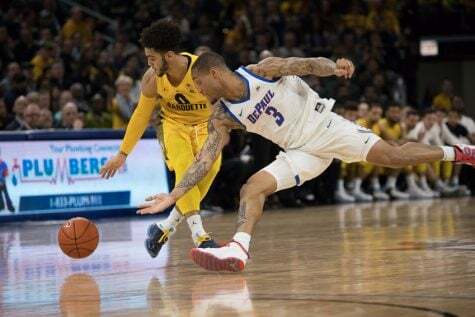 This past fall, DePaul announced that the Wintrust Arena era would mark a new direction for the men’s basketball program, but the Blue Demons once again found themselves at the bottom of the Big East standings. Loyola, on the other hand, crashed the Big Dance, becoming one of the most captivating teams in the nation. 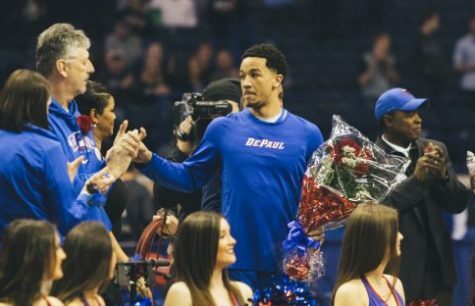 Meanwhile, the perception of DePaul men’s basketball program has gone unchanged — and it has arguably grown worse. 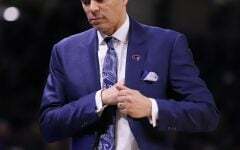 Losing season after losing season has created frustration among fans and alumni, many of whom point to a series of poor hires by sitting athletic director Jean Lenti Ponsetto. After 16 years and a mere handful of winning seasons, calls for accountability have fallen on deaf ears. 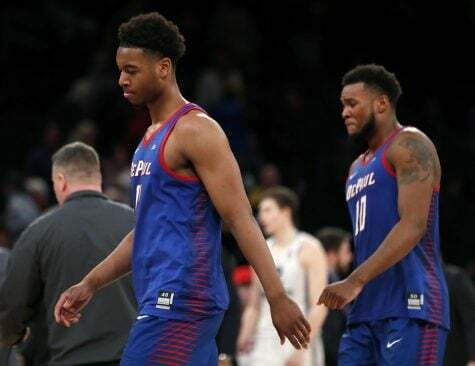 Eli Cain and Tre’Darius McCallum exit the court after losing in the Big East Tournament. When former DePaul President Dennis H. Holtschneider left the university at the end of the 2016-17 academic year, there was some optimism that the new administration of A. Gabriel Esteban could take a hard look at the athletic department and call for a change of leadership. But after watching another failed basketball season, Esteban didn’t pull the trigger. While Lenti Ponsetto enjoys the verbal support of a new administration, the support of students and alumni continues to wain and the program continues to take hits. 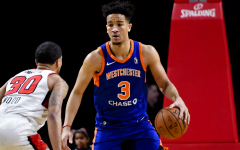 Sophomore guard Brandon Cyrus became the eighth player in Leitao’s second stint with the Blue Demons to transfer away from the program early last week. 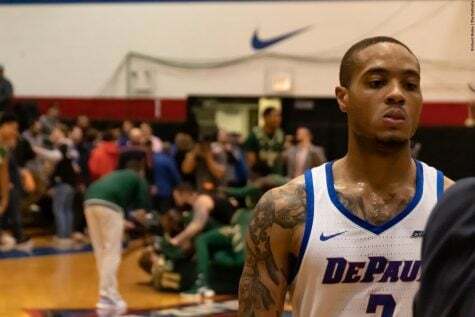 Day’s later, Max Strus — DePaul’s leading scorer — declared for the NBA draft. And Tyger Campbell notably flirted with the program but eventually chose greener pastures at UCLA. Esteban preaches patience, much as Lenti Ponsetto did after coming under fire for another lackluster season. He says that, in comparison, Seton Hall didn’t reach the tournament until 2016, despite their new stadium being built in 2010. This year marks the Pirates third straight NCAA tournament appearance. 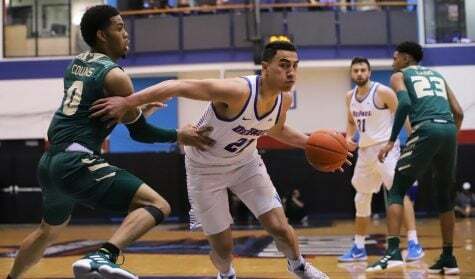 DePaul lost seven games by five points or less this season, but that may not exactly point to growth. 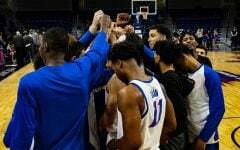 The Blue Demons lost a number of close games to top-25 teams over the course of the 2016-17 season as well, but the team was still lacking in talent. 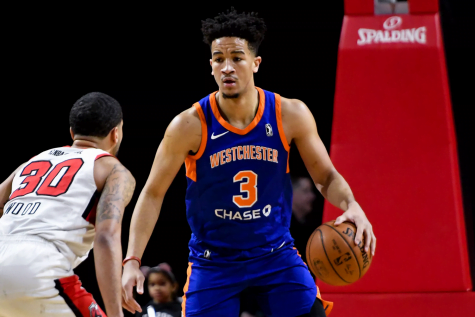 In contrast, the 2017-18 roster was full of raw talent in players like Strus, Marin Maric and Eli Cain, but close losses still dominated the season narrative. The greatest struggle for the Blue Demons outside of winning has been attendance. 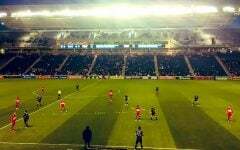 Freedom of Information Act requests revealed that turnstile attendance (the number of people actually attending each game) averaged under 3,000 people with just a handful on games remaining in the season. Student attendance has been even worse. 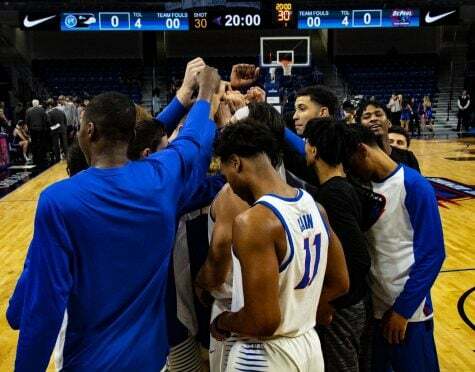 A glance toward the new elevated – and empty – student section shows just how strong the student body’s apathy for DePaul Athletics has become. Loyola’s rise into the national spotlight and the NCAA Tournament wasn’t helped along by a new arena. This year, the Ramblers played their home games on campus in the Joseph J. Gentile arena, just as they have since it opened in 1996. And by the end of the year, attendance was not a problem for Chicago’s second largest Catholic University. Those are things that who looks at, #FireJLP and horse players? There is ZERO reason to be encouraged about the future of the program. Same principals in charge and the new guy seemingly a doormat. Teams take a night off when they play DePaul, or at best play down to their competition. Which is redundant. When a coach saves his job by invoking “DePaul” as a comparison, it’s pathetic. And that St John’s AD, who cared much-much more than DePaul’s about Men’s BB, saw how much worse it could be. Still moved on shortly therafter despite Steve Lavin having improved the condition of the SJU program. “Nobody wants to win more than I do.” Winners don’t gauge progress by close loses and disregard records and negative momentum, transfers and recruits running away. Get real, Dr. Esteban. You inherited a trainwreck and are uniquely positioned to become a hero. Just do it. 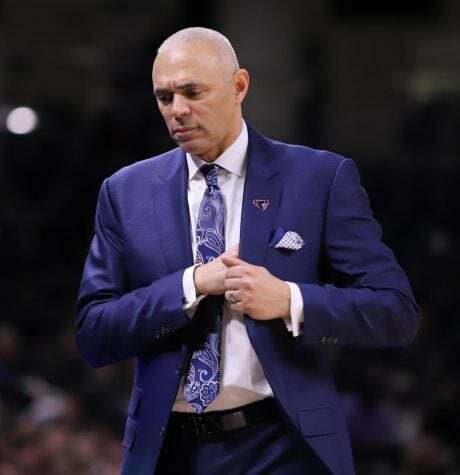 Dave Leitao and Jean Lenti Ponsetto, my advice to you is to disregard all of this noise and flack from these annoying long time fans, these deep rooted fans with a connection to the “good old days”. Relax. Dave. You mentioned that you are in a results based business but in fact that is not true at all. You and Mrs. Lenti has never been accountable for your results and there is no evidence that this is going to change. The new president would have acted decisively and upon reflection I now see that he has in fact acted decisively. His decision is that he too chooses not to hold you and our current A.D. accountable for your results. So Dave, relax. Enjoy yourself. Given that winning is off the table, you can dive deep on all of those ‘reasons to be very very proud’ that you speak of. That material should make for a terrific scrapbook that I can look back on with pride 10 years from now. I wouldn’t be surprised if that included a good number of DePaul alumni shifting over! Go Ramblers!